I don't often do a post which essentially just links to another blog post but I am making an exception here. This is simply one of the best blog posts I have ever read from award winning mathematician Tim Gowers. He goes through all of the arguments for and against AV and FPTP and with intelligence and humour analyses each one from a mathematical perspective but in an accessible way. He is clearly in favour of a switch to AV but he is not afraid to point out its weaknesses as well as its strengths. It is a very long post and will probably take 20 or 30 minutes to read in full but it is very much worth it. If you are still undecided about AV (and even if you think you aren't) I heartily recommend it. Imagine that AV has been backed by a narrow majority in the referendum, on a very low turnout. For many Tories, especially David Cameron, that’s a nightmare scenario. In those circumstances, would he be able to convince his own side to trigger the implementation of AV by voting through new boundaries? Don’t forget, the Tories aren’t expected to get off scot-free when the Commission presents the new constituency map; at least thirteen Conservatives look set to lose their seats, and many more will be expected to campaign within vastly changed boundaries with no guarantee of success, especially under AV. Come 2013, the price that Tory backbenchers are being asked to pay in order to keep Nick Clegg in Ministerial cars might begin to look a tad high. They would have the power to stop the introduction of AV by voting down the implementation of the new boundaries, if they joined forces with Labour. That would surely be a coalition breaker, but it’s not inconceivable. It's a thought provoking post, and fair play to Sadie for highlighting this anomaly but I am afraid in reality I just cannot see it happening. Irrespective of the technical whys and wherefores, as far as the public are concerned they are voting in a referendum to change the voting system. If there is a "No" vote then we stick with First Past the Post. But if there is a "Yes" vote, no matter how narrow and no matter how low the turnout, people will expect the change to be implemented. If through some parliamentary alchemy the Tories manage to prevent this from happening I expect there would be a constitutional crisis. The will of the people through a referendum would be being thwarted. We don't often have national referenda in this country but were parliamentarians to so blatantly override the result in this way in order to preserve a voting system that keeps them in their jobs then the backlash seen from the expenses scandal would look like a minor spat. I suspect even plenty who voted "No" would be disgusted by such a manoeuvre. And that's why I just cannot see it happening. MPs will surely know the political dynamite they are playing with under these circumstances and hence would not pursue something so obviously anti-democratic. If it is a "Yes" vote next month then I am sure AV will become the electoral system within short order. Vox populi, vox Dei. Life chances should not be determined by background. Prospects should never be narrowed by the postcode of the home you are born into. Birth should never be destiny. The problem is, on the 29th of this month I suspect Nick Clegg along with lots of his political contemporaries will be attending a wedding in Westminster Abbey. A wedding of a woman to a man who once his grandmother and father have died will become our head of state. He will achieve this office very specifically because of who he was born to. In other words a very clear example of the exact opposite of what Nick Clegg believes should happen. This road is not open to all. Instead it is only open to a very select group of people, all of whom are closely related to each other. Nick should not attend the wedding. I am not suggesting he makes a big thing of it (although I would!) but I am sure he could quietly find something else to be doing that day. Otherwise he is helping to validate and perpetuate the system that props up the entire class structure of this country and that contributes to the problems highlighted so eloquently by our Deputy Prime Minister in the above quoted speech. Does Cameron feel beholden to Lansley? With the news that Andrew Lansley's NHS reforms are going to "pause" for more "consultation" it is worth reflecting on how we reached this point. David Cameron has been a lot more relaxed than his recent predecessors as PM regarding tightly controlling the activities of ministers and their departments. And good on him I say. I think ensuring ministers have proper power to implement their programmes is generally a good thing and should lead to less "government by tabloid headlines". However I do think in the case of the NHS that Cameron perhaps should have been a bit more attuned to what was happening. The health service has an absolutely pivotal role in the lives of the people of this country and like it or not, the Tories are not well trusted in this area of policy. It was always likely that any reform of it would receive a lot of focus and scrutiny and that the government was going to need to tread carefully. Instead Andrew Lansley has been given free reign to push ahead with a very substantial programme of reform. I do wonder if the dynamics between the Prime Minister and the Secretary of State for Health may have had some role to play in this. David Cameron's first proper political job was in the Conservative Research Department from 1988 - 1993. And the head of that organisation from 1990 onwards was none other than Andrew Lansley. It can be odd to find yourself in a position of authority over someone who was previously in a position of authority over you and this can do funny things to relationships. Is it possible that Cameron has felt less able to intervene with Lansley's activities than his instincts may have been telling him because of the fact that many moons ago he used to be his boss? I expect some will dismiss this as nonsense but human relationships are very complex things. It would not surprise me if, even only at a subconscious level, Cameron has been less inclined to pull Lansley up because of their history. It would seem clear that Cameron's political antennae is now amply registering the danger and he has somewhat belatedly become heavily involved to try and avoid a potential legislative car crash. PMs have to have a ruthless streak even when it comes to former bosses. Perhaps it has taken this episode to bring that home to the latest holder of the office. One of the arguments I keep hearing against the Lib Dems regarding AV is that there are loads of more important things than electoral reform (the economy, the health service, schools etc. etc.) and that it is disgraceful that the party should have insisted on a referendum on AV as part of the coalition agreement above all these other things. Margaret Beckett was at it on Any Questions this week, although Lynne Featherstone rightly pointed out that lifting the lowest earners out of tax and the pupil premium and green investment were all considered of equal importance too given they were the 4 things on the front of the manifesto. So straight away this line of attack is untrue. However I accept the point that some people will view wanting to change the electoral system as of less importance than various other things. The problem is that is not peculiar to now. There are always things that need to be sorted out and the argument that "now is not the right time" could be used in perpetuity. And this is why that particular argument irritates me. Because it is a cheap way of trying to retain the status quo without even trying to argue based on the merits or otherwise of the systems on offer. It is simply an attempt to paint those who advocate change as doing so in bad faith and distracting from "real" issues. Like the method used to elect our primary legislative chamber (that the British people have never had a say on) is completely unimportant. Anyway, I have a suggestion for all of those in the No2AV camp who think the referendum is a distraction and that there are more important things to focus on. If you take an average of the polls it would appear that a majority is already in favour of AV. So how about we change the voting system to AV without a referendum? This will certainly take less time and be less of a "distraction" from other legislative priorities. We can keep it for future elections and then, at some point in the future where everyone agrees that there are no other pressing priorities, we can have a referendum to see if we stick with AV or switch back to FPTP. No, didn't think so. I think we all know we would never reach that mythical point where there were no other issues that some would consider a higher priority than voting on the electoral system. 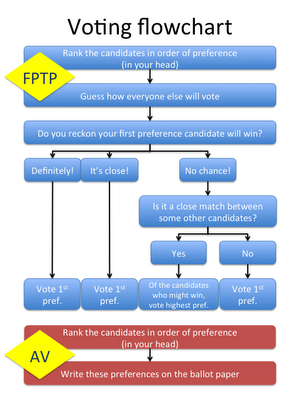 As I keep saying, the No camp should be arguing for the merits of FPTP. After all, that's what we will be stuck with if No wins the day next month. Instead they seem determined to argue on spurious costs, illogical nonsense about multiple votes, erroneous claims about the influence of the BNP under AV (in that case why are they campaigning against it?) and arguments that we shouldn't be having this vote in the first place. Oh and the latest one that Yes leaflets are somehow dodgy because the people used on them have been regionalised and hence a black Londoner is not on the West Country leaflets. I just hope the level of debate gets better in the remaining weeks of the campaign. I suspect my hope is forlorn though. Excellent post here from Anthony Smith highlighting how under First Past the Post, the tortuous decision process you have to go through in order to make your vote actually count makes it more complicated than it would be under Alternative Vote.